The WebM Project has been slowly getting more support from the browser community with Edge 14 adding support in the Anniversary edition of Windows 10. At the same time more .webm files are created by new HTML5 APIs like WebRTC when recording WebRTC sessions and the MediaRecorder API. In this post I’ll cover how to convert a large library of .webm files to MP4 with FFmpeg – the free and open source Swiss army knife of video conversion. audio streams compressed with the Vorbis or Opus audio codecs. A key benefit with webm is that it’s open for anyone to implement and improve. Webm is also optimized for the web with a simple container and low computational footprint to enable playback on any device, including low-power mobile devices. So WebM is having quite a hard time against MP4 files with H.264 video and AAC audio which play across a very wide net of devices and browsers. 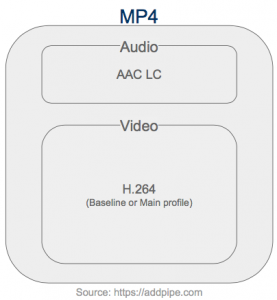 MP4 files have the ability to work natively on all devices and browsers but for that to happen we need to ensure the MP4 file contains H.264 video and AAC-LC for sound. On top of that, to ensure our video can be played on older devices like the iPhone 5S, we will be using H.264’s High Profile and Level 4.2 . Encoding however is mostly supported through external libraries and we will be needing them to encode H.264 video and AAC audio. AAC-LC native native and libfdk_aac external. Our examples will be using the native AAC-LC library. For details on how to use the 2nd one (it’s better) check out the FFmpeg’s AAC Encoding Guide. Video data: Most WebM files will contain VP8 or VP9 for video. For them we’ll transcode the video data to H.264. Some (rare) .webm files already contain H.264 video in which case we can simply copy the video data over and transcode just the audio. 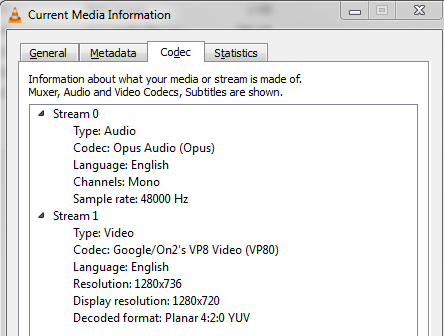 When the WebM file contains VP8 or VP9 video, you have no choice but to transcode both the video and audio. Video conversion can be a lengthy and CPU intensive process, depending on file size, video and audio quality, video resolution, etc. but FFmpeg provides a series of presets and controls to help you optimize for quality or faster conversions. To ensure the highest compatibility with older iOS or Android devices you will need to use certain encoding profiles and levels. For example a video encoded with the High Profile and Level 4.2 will work on iPhone 5S and newer but not on older iOS devices.